EPC is the annual meeting of the Australasian Society for Experimental Psychology. This meeting provides a forum for presenting new research across the broad spectrum of experimental psychology. EPC has been held annually since the first meeting at Monash University in 1974. The Australasian Society for Experimental Psychology was created to conduct an annual meeting for the presentation of research in experimental psychology (broadly defined). Because its only role was to conduct the meeting it was initially known as the Experimental Psychology Conference or EPC and still regularly uses that title. The Society has had a band of loyal participants. Since its inception the meeting has adopted an extended talk / question time format (currently 15 minutes / 5 minutes) which marries well with the role of the meeting in providing more tutorial style talks than many international conferences. There has always been a focus on graduate students providing their first talks. The extra question time allows for constructive, rather than telegraphic, feedback. The main conference will be held at the Hobart Function and Conference Centre on Hobart’s waterfront. The workshops on Wednesday will be held at the University of Tasmania’s Sandy Bay Campus. Day registrations are available for Thursday, Friday or Saturday. Academic $250.00. Post-Doc $195.00. Full-time Student $150.00. All Conference dinner tickets, $120, can be purchased when registering. 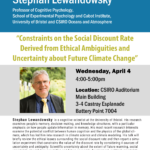 Please join EPC Plenary Speaker, Professor Stephan Lewandowsky for a pre-conference presentation on Wednesday 4th April, 4-5pm at CSIRO, 3-4 Castray Esplanade, Battery Point. Don’t miss the opportunity to attend this free lecture from a world renowned expert in the psychology of climate change prior to his appearance at EPC 2018. Host: Professor Simon Dennis (Director, Complex Human Data Hub, Melbourne School of Psychological Sciences). Summary: In this workshop, I will describe the unforgettable.me experience sampling system. In addition to the unforgettable.me app which can capture accelerometry, GPS, audio and images continuously, the system can stream data from over 400 other sources, such as wearables, social media, financial services, appliances and cars. I will discuss machine learning and dynamic systems methods for analysing the data. I will demonstrate the personal memory system that we are constructing and show how we are using the data to build models of human memory. This year the workshop will be hands on, so I ask that you bring along your Android or iOS phone or tablet plus your laptop. Summary: The forum on “emerging research in cognition, emotion, and motivation” will hold its meeting immediately preceding the 2018 Australasian Experimental Psychology Conference. We invite all researchers at the interface of cognition, emotion, and motivation to participate. The forum program is designed to be interactive and will include plenty of audience participation. It provides a valuable opportunity to network and explore collaborations, to share and hear about developing lines of research, and it will be a great way to kick off the conference. Host: Professor Alex Holcombe (School of Psychology, The University of Sydney). Medilink is based in Sydney and has been operational for over 25 years. Medilink distributes premium brand scientific instrumentation to clinical and research end users in Australia and New Zealand. Medilink supplies and services a selection of products that support Neuroscientists through Neuro-diagnostics, Neuro-modulation, Neuro-stimulation, Neuro-imaging and Neuro-navigation. Applications include rTMS, fNIRS, EEG, and ECT technology. Symbiotic Devices services Australia and New Zealand, providing both innovative, best-in-class technologies, and technical and scientific support, for EEG/ERP/EP, TMS, tDCS/HD-tDCS, fNIRS, EMG, NCS, IONM and BCI and integrated solutions for combined measurements with fMRI, fNIRS, TMS, MEG & tDCS. Symbiotic Devices’ business is anchored in its core values of providing a benefit to our clinical and research communities through technology and support, and contributing to a sustainable and successful research and clinical sector in Australian and New Zealand. Symbiotic Devices proudly represents Brain Products, EasyCap, Rogue Research and Rogue Resolutions, CED, Deymed, Cadwell, NeuroConn/NeuroCare, Rhythmlink, Pearl Technology, VPixx and Artinis. For questions about the conference program please contact Professor Andrew Heathcote. 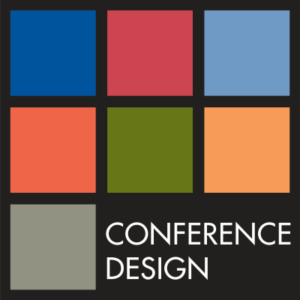 For registration and accommodation enquiries, please contact the team at Conference Design. We invite you to submit an abstract for presentation at the 2018 Experimental Psychology Conference. This meeting provides a forum for presenting new research across the broad spectrum of experimental psychology. EPC has been held annually since the first meeting at Monash University in 1974. There has always been a focus on graduate students providing their first talks. The extra question time allows for constructive, rather than telegraphic, feedback. It is anticipated featured oral presentations will be allocated 20 minutes for presentation, including 5 minutes for question time. An A0 portrait size poster that will be displayed for the duration of the Conference. Presenters will be asked to attend their poster during a poster session on the evening of Friday 6 April to discuss the poster with other delegates. Submissions has been EXTENDED UNTIL 21st of FEBRUARY and abstracts can be submitted via the presentation portal on this website. Authors will be notified of the status of their abstracts and the presentation format in early March. The program committee will review all submitted abstracts. As there are limited places for talks, some abstracts submitted for talks may be offered posters. Authors in these cases will be advised and asked to confirm whether they wish to present a poster. Program and abstract book for the 44th Experimental Psychology Conference 2017. Presenters will take their Powerpoint slides to the meeting on a memory stick, where a student assistant will help load your presentation. Video and audio clips should be embedded in your Powerpoint slides rather than linking to external files. It is preferable that all slides run from the presentation computer. However, if you have a complex presentation, which includes multiple media files, we suggest you bring your own laptop as a backup in case of difficulties loading your presentation.